London: Arsenal manager Arsene Wenger faces the might of Manchester City for the second time in five days on Thursday as the Gunners seek salvation after an abject display in losing the League Cup final 3-0. City's victory on Sunday delivered the first trophy of the Pep Guardiola era and underlined the sense that the two clubs are on radically different trajectories. 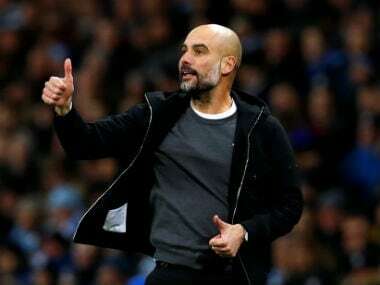 Guardiola's men also enjoy a 13-point lead at the top of the Premier League and are virtually assured of their place in the Champions League quarter-finals, thanks to a 4-0 last-16, first-leg win in Basel. What is galling for Wenger and Arsenal is that in many ways Guardiola is the modern-day incarnation of what the Frenchman used to be in his first decade at the club. Wenger's early years married attractive, aggressive football with a winning culture. While some of the frills to Arsenal's football have remained in the second half of his 22-year reign, the club have failed consistently to challenge for the biggest prizes. "This development of mediocrity has to be arrested," Arsenal's second-highest goalscorer of all time, Ian Wright, who played under Wenger, told BBC radio. 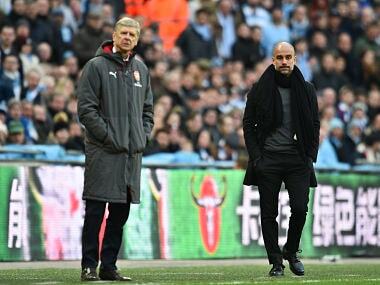 Guardiola shares Wenger's ideals of how the game should be played and has spoken glowingly of his admiration for his counterpart's longevity. "I would have liked to have played for him," said Guardiola ahead of Sunday's final. "He likes one type of player, with quality and respect for the ball. They are things I like a lot, so if people say we play a little bit like Arsenal of the last 20 years then it's good for us." He has shone after the first season of his career without silverware in his debut campaign at City in 2016-17. Rather than abandon his principles, the Catalan has doubled down on the passing and pressing game he made famous at Barcelona to create the spectacle and success for which he was lured to Manchester by the club's cash-rich Abu-Dhabi owners in the first place. Wenger, by contrast, despite an enviable record of success in the FA Cup in recent years, has failed to arrest his side's general slide from the pinnacle of the English game. Guardiola has also demonstrated a far shrewder sense of timing than Wenger in knowing when to walk away. He left his boyhood club in Barca as their most successful coach because the intense demands of four seasons in the job had taken their toll. Likewise, his time at Bayern never seemed likely to extend beyond the initial three-year contract he signed despite winning three straight Bundesliga titles. "No chance," Guardiola responded at the thought of matching Wenger's two-decade-long stay at City. "That is not going to happen because I am not going to train in 20 years more." City will fall short of one of Wenger's greatest achievements. Defeat at Liverpool last month means they cannot go a full Premier League season unbeaten as Arsenal did in their last title-winning campaign of 2003-04. 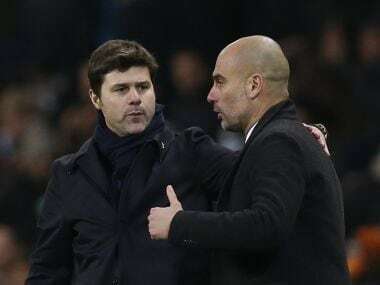 "Arsene's record belongs to him, we are not going to break it — he has to be calm," said Guardiola earlier in the campaign. It may be the only thing remaining that Wenger holds over English football's new dominant power.